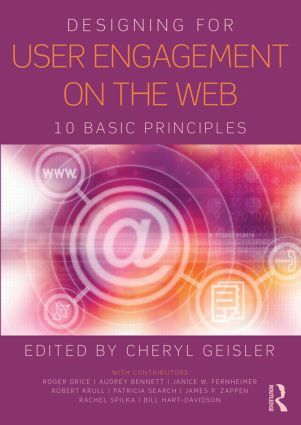 Designing for User Engagement on the Web: 10 Basic Principles is concerned with making user experience engaging. The cascade of social web applications we are now familiar with — blogs, consumer reviews, wikis, and social networking — are all engaging experiences. But engagement is an increasingly common goal in business and productivity environments as well. This book provides a foundation for all those seeking to design engaging user experiences rich in communication and interaction. Combining a handbook on basic principles with case studies, it provides readers with a rich understanding of engagement: extending a welcome, setting the context, making a connection, sharing control, supporting interaction, creating a sense of place, and planning to continue the engagement. Based on research funded by the Society for Technical Communication, the case studies illustrate how designers build community in order to support education, connect kids to community resources, introduce users to other cultures, foster collaboration, encourage activism, and much more. Whatever your motive, if you aim to create engaging user experiences, you will want to explore Designing for User Engagement on the Web.